Nuts are a mainstay in my diet. I love them for lots of reasons, one being how versatile they are. I throw them in salads; blend them up to make nut butters and energy bars; use them to make granola and trail mix; add them to rice dishes; bake with them in the form of nut flours and meals; eat them by the handful; and on an on. There’s no limit when it comes to creative ways to use nuts in recipes. That’s what’s so great about cooking and baking – you get to make things up, color outside the lines, have fun, and not follow directions. I’m going to provide you with a launching pad of information and some ideas about nuts. This post is part 1 in a nutty series. Okay, what are these little gems? If you guessed macadamia nuts, you’re right. Macadamias are large, spreading evergreen trees native to the rain forests of Australia. They were introduced to Hawaii and California in the 1880s and two of the original trees are still standing on the Berkeley campus of the University of California. According to a 2003 study sited in The Journal of Nutrition, macadamia nuts, despite their high level of fat, favorably modified lipid profiles in men with high cholesterol levels. Organic macadamia nut oil offers a healthy one-to-one omega-3/omega-6 fatty acid ratio, has a higher smoking point than olive oil, is incredibly versatile, and tastes pretty yummy drizzled on fish, veggies, or salads. The chopped nuts taste great in baked goods, homemade trail mix, and tossed into spinach salads. It also makes for a nice (although rather expensive) moisturizing oil. I love pecans – must be that sweet tooth of mine. I add them to my granola, put them in cookies, use them in my apple pecan cheesecake, and mix them into salads. They’re sweet and rich, but aren’t at the top of my nutritional profile list. They have a relatively high ratio of omega-6 to omega-3 fatty acids – the other way around is much better. They’re also high in calories. On the other hand, they’re low in sodium and cholesterol. Plus they’re rich in manganese, which helps maintain normal blood sugar levels, promotes healthy thyroid function, and aids in keeping bones strong and healthy. These are Brazil nuts and despite their name, the largest exporter of the nuts is Bolivia and not Brazil. The tree is huge, reaching 100 to 150 feet tall with a trunk diameter of 3 to 6.5 feet. It’s one of the largest trees in the Amazon rain forest, which I find fascinating. These trees often live for more than 500 years and can even reach 1,000 years old if conditions are right. Isn’t that cool?! According to Wikipedia, Brazil nuts are harvested from wild collection rather than from plantations. This model is being advanced as a sustainable way of generating income from the rain forest without destroying it. 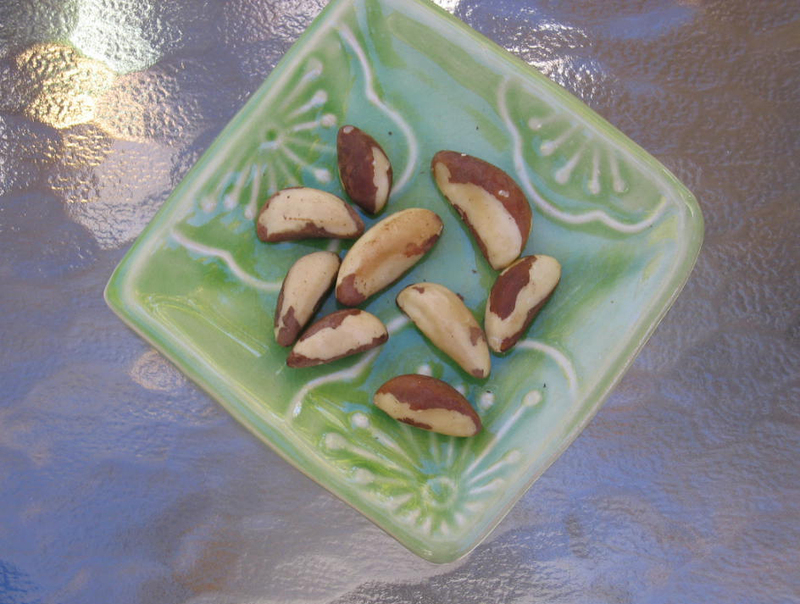 Brazil nuts are high in saturated fat and can be substituted for macadamia nuts in many recipes. They’re also commonly used in fruitcakes or pressed for oil. Brazil nuts are rich in selenium, magnesium, and thiamine. Some studies suggest selenium is protective against prostate cancer. Shelled nuts that contain a lot of fat, like macadamias and Brazil nuts, become rancid fairly quickly, so store them in the refrigerator. This entry was posted on Tuesday, January 22nd, 2008 at 1:05 pm	and is filed under Gluten-Free Recipes, Nutrition Therapy, Super Foods. You can follow any responses to this entry through the RSS 2.0 feed. You can leave a response, or trackback from your own site. Brazil nuts are some of my favorite nuts on the planet. A good way to enjoy them, even though it’s not as healthy, but you can roll them in coconut oil and then roll them in dark cocoa powder. AMAZING!! Yum! Nuts are my go-to snack. Thanks for all the info! I remember reading recently that Brazil Nuts, if eaten more than four daily, can cause selenium toxicity. Any idea if this is true? BTW — I love your blog. You seem to talk about many of my favorite things: health, exercise, the outdoors and of course, gluten-free cooking. Hey Tevis – coconut oil is okay, as is cocoa powder, so that treat does sound amazing. High in calories, but in small doses, wow! Lizzie – you’re right about the selenium content in Brazil nuts, but it all depends on the soil they’re grown in. Brazil nuts grown in areas with high-selenium soil can have a whopping 544 mcg of selenium in about 6 nuts, but if grown in low-selenium soil, the content in the nut is about 10 times less. The suggested upper intake level (UL) is 400 mcg/day, so yes, eating 4 nuts daily could put you over that level. But, you don’t know whether your Brazil nut was grown in selenium-rich soil or not, so I wouldn’t worry about it unless you’re eating them every day. You’re right though, high doses can cause toxicity. Both humans and animals require selenium in small amounts and deficiencies can cause serious problems. It’s an essential element, so we need to get it from outside sources – plants grown in selenium-rich soil. FYI – New Zealand has almost no selenium in its soil. Wow! It’s all about the soil — who’d a thunk? You’re awesome Melissa! Thanks for such a thoughtful reply. Brazil nuts aren’t a staple in my kitchen, so I’m pretty sure I’m not at risk.